GREENSBORO, NC (Dec. 5, 2017) – Mack Trucks and Petty’s Garage, the high-performance speed shop founded in 2008 by NASCAR legend Richard Petty, recently inked a partnership agreement naming Mack the official transportation sponsor for the Garage. 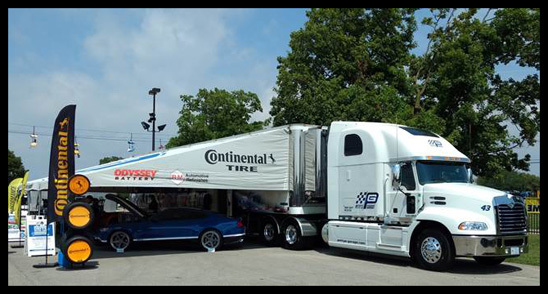 Under the agreement, Petty’s Garage, headquartered in Level Cross, North Carolina, received a 2018 Mack® Pinnacle™ Axle Back model equipped with an MP®8-445C engine to transport cars to public events through its Performance Tour. The tour brings Petty’s Garage to the fans and auto enthusiasts at select events across the U.S.
Petty’s Garage is located at the historic facility where winning stock cars were developed for more than 60 years. When the race team moved to Mooresville, North Carolina, Petty began Petty’s Garage to deliver the ultimate driving experience to performance enthusiasts. Mack Trucks already is the “Official Hauler of NASCAR®.” As part of the agreement, Mack provided a fleet of custom-designed Mack Pinnacle sleeper models spec’d to answer the challenges of the grueling NASCAR schedule.